Did you know that most city tap water deposits the following toxins into your body? Chlorine is a toxin used to sanitize water. Sanitation is necessary but drinking chlorine is not. Fluoride is a neurotoxic chemical banned in Western Europe. Microorganisms, bacteria and viruses circulate in city water supplies. Heavy metals such as lead, copper and aluminum often pass into water from plumbing. Pharmaceuticals from human and animal waste (such as antibiotics and hormones) are not removed in city water treatment facilities. Fluoride is a neurotoxin and does not belong in your body. 97% of Western Europe has rejected water fluoridation. 50 studies have linked fluoride with reduced IQ in children. The cancer risk to people who drink chlorinated water is 93 percent higher than those who don't. Americans are ingesting from 300 to 600 times what the Environmental Protection Agency considers a “safe” amount of chlorine. When I first learned about the toxins in my tap water, I was a college student. I needed an effective, budget-friendly filter that I could transport between my parent’s house and my on-campus housing. Pitcher filters like Pur and Brita remove only a small percent of the above toxins. Filters installed under-the-counter were expensive and not portable. And I couldn’t justify the price of high-tech alkalizing filters, which often do not remove fluoride. The Berkey Filter fit my needs perfectly. It is the most affordable filter that effectively removes fluoride. It also removes chlorine, microorganisms, heavy metals and pharmaceuticals. Maintenance work and cost is minimal, and assembly is easy. For emergency preparedness purposes, it can turn pool water into drinking water without electricity. It is travel-friendly, unlike under-counter options. Utilities do the best job that they can treating a big problem with limited resources, but we must do better. It is not uncommon for people to drink tap water laced with 20 or 30 chemical contaminants. This water may be legal, but it raises serious health concerns. - Jane Houlihan, The Environmental Working group's senior vice president for research. Ready to make your tap water safe? Here’s how to get started. 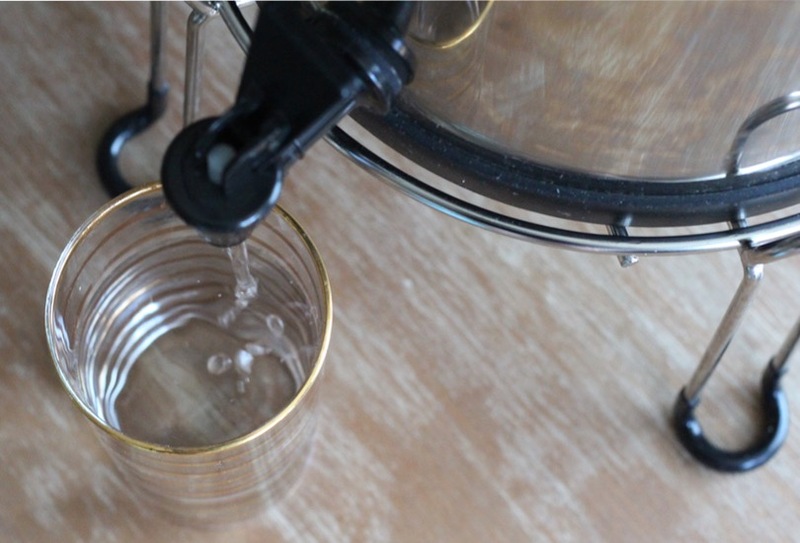 A Big Berkey Filter, available here. Also select the Shower Filter, if you want safer bathing water (chlorine is toxic and also dries out the skin and hair). Make sure you get the Stainless Steel Stand. 5% off accessories for your Berkey, including the essential fluoride filters, the stand, and the shower filter. A FREE Boroux glass water bottle. These are the most elegant and leakproof glass water bottle I’ve used. Free 2-day shipping, which matches Amazon in speed and offers much better customer service (UPDATE: Berkey no longer guarantees 2-day shipping, but most orders arrives in 2-3 days). A 30-day return policy. If you are not satisfied with your purchase, even your return shipping charges are covered. A lifetime warranty on your filter. I used your coupon code a few months back and bought the big Berkey. We love it! I went with a big one and didn't regret it... I use the filtered water to cook with, make tea/coffee, even fill the dog's water bowl with the good stuff! I set mine up yesterday and am loving the convenience! How often should I replace the filters? If you use four gallons of water per day (ex: a small family), the carbon filters would need to be replaced every four years. The fluoride filters need to be replaced every 1000 gallons or a year, whichever comes first. How does Berkey compare to reverse osmosis or distillation? Berkey has a better ability to remove pathogenic bacteria than does reverse osmosis. Distilling removes the beneficial minerals and does not remove the Volatile Organic Compounds (VOCs), which are chemicals found in herbicides and pesticides. Aluminum oxide is inert, meaning not absorbable, because it does not have the ability to chemically separate and bind with body tissues. As a matter of fact, aluminum oxide is inert enough to comprise 2.0% – 2.5% of our bones. Lab tests do not distinguish between aluminum and aluminum oxide. Trace amounts of aluminum oxide are measured in the filtered Berkey water. Even so, Berkey filters are shown to remove 85-99% of aluminum from the water. Do you have a recommendation for a shower filter? 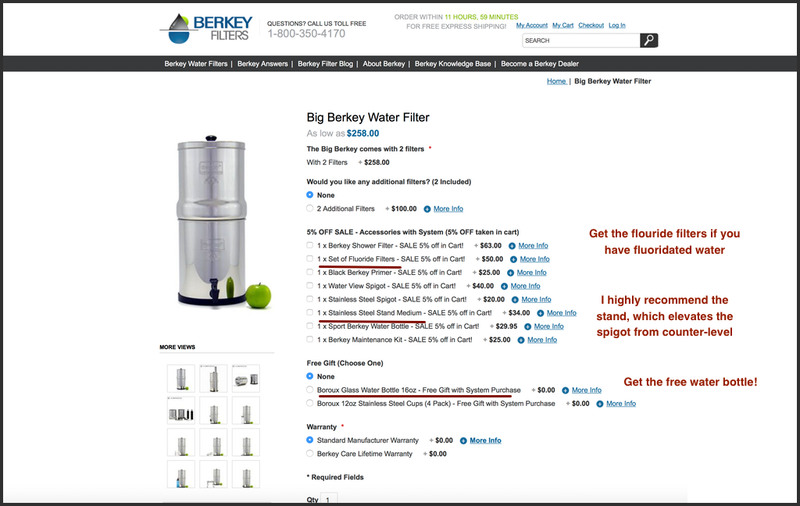 Yes, I use the Berkey Shower Filter — available here — to remove chlorine, which is both inhaled and absorbed through the skin during showering. It does not remove fluoride from bathing water. That requires the investment of in-house filtration system — and since I lease my home, I can’t install a filtration system. The water in the top chamber of my Berkey doesn’t drain all the way. Is this normal? Yes, there is often an inch of water left in the upper chamber. This is because the lower the water in the top chamber, the lower the pressure to force the water through the microparticles of the carbon filters. Simply add more water to the top chamber to increase this filtering pressure. With use, the flow rate of your filter will slow. Remedy this by cleaning your black filters every couple of months, as part of a regular maintenance. This entails just a couple minutes of scrubbing the black filters with a Scotch Brite pad. See instructions here. You can also fit your Big Berkey with four carbon filters and four fluoride filters, rather than the standard two each, to the double flow rate. Can I travel with my Berkey? Yep! It takes only 5 minutes to disassemble the Berkey and another few minutes for assembly, so it makes a travel-friendly filter solution. I’ve brought my Berkey to hotel rooms and a campsite. It also works well in offices. When assembling and diassembling your filter for travel, wash your hands well, and pack the filters in clean plastic bags. Wash the inside of the metal container before assembling to remove any bacteria. The carbon filters are treated to prevent microbial growth. All the same, I do not leave my filters left moist and unused. If I will not be using my filter for more than 2 days, I empty it out and place the top of the filter on clean paper towels before I leave. This ensures light and air circulation around the carbon filters to prevent microbial growth.